An opinion poll by Angus Reid Public Opinion backs up the running order from yesterday's Survation's poll, albeit with different numbers. According to Angus Reid, Labour are increasing their lead with 42% of the vote, the Tories are second with 33%, the Limp Dems third with 8% and UKIP fourth with 7%. The SNP are way in front in Scotland with a large enough majority to give them 4% in the UK-wide tally. The breakdown by region shows consistent support for UKIP across England, not just traditional Tory-voting areas which is further proof that UKIP is gaining true cross-party support. 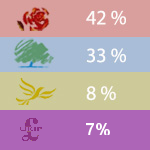 The highest support for UKIP can be found in the south of England although this doesn't cater for the "Midlands Wales effect" skewing the figures for the Midlands: polling companies include Wales in with the Midlands which prevents an accurate figure for the East- and West Midlands euroregions where there is considerable support for UKIP. The "Midland Wales effect" doesn't skew the UK figures but it does make them pretty useless for predicting EU or local election results. The results of opinion polls are just an indication of popular support before party propaganda, BBC bias and last minute bottlers bump up the votes for the LibLabCon parties but the figures are encouraging nonetheless.